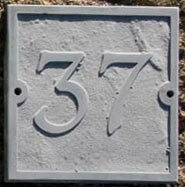 Numbers - Create your own design - Slate House Number Signs - Let your imagination run wild! 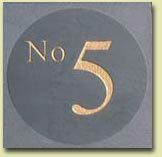 Create your own design slate house number sign. Each one can be completely unique. We can use many different fonts and letter colours. 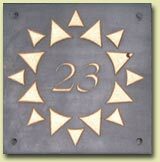 We have lots of decorative motifs available. 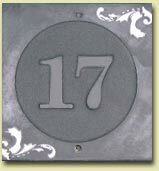 We can also create interesting effects by blasting away the slate either around the number leaving it proud and unpainted, or as a border in relief leave the shape of your choice proud. We can then blast a number into the shape. 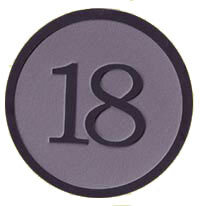 Slate Colour - We normally use grey slate but can use the coloured slate if prefered. For raised and unpainted is the best option. 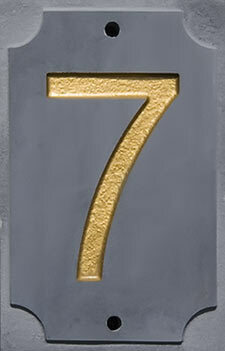 Motifs - We have a number of standard motifs which can be used on number signs. Letter Colours - Black, white, gold, silver, cream, salmon pink, purple, emerald green, dark blue and mid blue. The two peices of slate above are both showing raised and unpainted letters. However one of the peices had interesting markings and the other had virtually no grain at all. Usually the result is somewhere between these two extremes. It is impossible to tell how each piece will look before we start sandblasting!